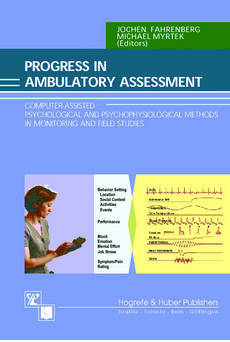 Ambulatory assessment – the acquisition of psychological and/or physiological data in a natural setting – is a field in which, as this book’s title indicates, rapid progress is being made. Indeed, ambulatory assessment is entering a period of transition: IT and online techniques are being developed and refined, and ever more researchers and clinicians from various fields are coming to realize the usefulness of data collected in real-time, under real-life conditions. With contributors from Austria, Germany, The Netherlands, Switzerland, the United Kingdom, and the United States, this book explores in detail the use of computer-assisted methods in both research and applied settings. Innovative techniques and approaches are described, as are concrete applications of a variety of methods in real-life occupational and clinical settings. Chapter 1: Computer-assisted Ambulatory Performance Tests in Everyday Situations: Construction, Evaluation, and Psychometric Properties of a Test Battery Measuring Mental Activation – Lothar Buse and Kurt Pawlik Chapter 2: Simultaneous Computer Assisted Assessment of Causal Attribution and Social Coping in Families – Meinrad Perrez, Peter Wilhelm, Dominik Schoebi, and Monique Horner Chapter 3: Psychological Monitoring in Sociodiagnostics – Urs Baumann, Ludwig Feichtinger, and Claudia Thiele Chapter 4: Electronic Momentary Assessment: Real-World, Real-Time Measurement of Patient Experience – Michael R. Hufford, Saul Shiffman, Jean Paty, and Arthur A. Stone Chapter 5: Psychological Assessment in Everyday Life by Hand-Held PC: Applications of MONITOR – Jochen Fahrenberg, Paul Hüttner, and Rainer Leonhart Chapter 6: Does the Retrospection Effect Hold as a Stable Phenomenon? First Results from a Transcultural Self-Monitoring Study of Mood in Brazil and Germany – Christoph Käppler and Stephan Rieder Chapter 7:Ambulatory Monitoring of Diurnal Changes in Pain in Chronic Pain Disorder, Migraine and Rheumatoid Arthritis – Guido Godaert, Marjolijn Sorbi, Madelon Peters, Caroline Dekkers, and Rinie Geenen Chapter 8: Development and User’s Acceptance of the General Electronic Psychotherapy Diary – Michael Hinkel and O. Berndt Scholz Chapter 9: States of Aversive Tension in Patients with Borderline Personality Disorder: A Controlled Field Study – Christian Stiglmayr, Tanja Grathwol, and Martin Bohus Chapter 10: Daily Mood Reports in Hindsight: Results of a Computer-Assisted Time Sampling Study – Petra Hank, Peter Schwenkmezger, and Jens Schumann Chapter 11: Time Series Analysis of Diary Data – Ralf Ott and O. Berndt Scholz Chapter 12: A Multi-level Approach to Analyze Ambulatory Assessment Data: An Examination of Family Members’ Emotional States in Daily Life – Peter Wilhelm. Chapter 13: Posture and Motion Analysis by Ambulatory Accelerometry – Johannes B. J. Bussmann, Hendrika J. G. van den Berg-Emons, and Henk J. Stam Chapter 14: Accelerometry in Clinical Psychophysiology – Joke Tulen, Anita Volkers, Dirk Stronks, Marinel Cavelaars, and Wim Groeneveld Chapter 15: Assessment of Posture, Motion, and Hand Tremor by Calibrated Accelerometry – Friedrich Foerster Chapter 16: Ambulatory Monitoring of Blood Pressure in Daily Life: A Tool for Investigating Psychosocial Processes – Andrew Steptoe Chapter 17: The Assessment of Blood Pressure Variability in Behavior Modification: The Identification of Relevant Situation and Mood Factors – Lutz Mussgay, Frithjof Niegot, and Heinz Rüddel Chapter 18: Ambulatory 24-hr Monitoring of Brachial and Finger Blood Pressure in Normotensive and Hypertensive Males – Reingard Seibt, André Berndt, Dieter Knöpfel, and Klaus Scheuch Chapter 19: Respiratory Pathophysiology of Clinical Anxiety States Outside the Laboratory: Assessment of End-tidal pCO2 , Respiratory Pattern Variability, and Transfer Function – Frank H. Wilhelm, Georg W. Alpers, Alicia E. Meuret, and Walton T. Roth Chapter 20: Effects of Workstress on Ambulatory Heart Rate, Heart Rate Variability, and Blood Pressure – Tanja G. M. Vrijkotte, Harrïette Riese, and Eco J. C. de Geus Chapter 21: Objective Characteristics of Jobs Affect Blood Pressure at Work, after Work and at Night – Renate Rau Chapter 22: Heart Rate Monitoring in an Academic Test Situation – Hans Zeier, Alexandra Häseli, and Joachim Fischer Chapter 23: On-line Measurement of Additional Heart Rate. Methodology and Applications – Michael Myrtek and Friedrich Foerster Chapter 24: Interactive Psychophysiological Monitoring of Emotions in Students‘ Everyday Life. A Replication Study – Michael Myrtek, Denis Zanda, and Eveline Aschenbrenner Chapter 25: Psychophysiological Inflight Monitoring – Glenn Wilson Chapter 26: Psychophysiological Monitoring of Air Traffic Controllers: Exploration, Simulation, and Validation – Joachim Vogt and Michael Kastner Chapter 27: Ecological Ambulatory Assessment in Aviation – Eamonn K. S. Hanson and Jan Barzanski Chapter 28: Ambulatory Monitoring of Menopausal Hot Flashes – Robert R. Freedman Chapter 29: Giving Feedback to Asthma Patients. Ambulatory Monitoring in Patient Education – Christian Leopold and Rainer Schandry Chapter 30: Ambulatory Assessment of Hypoglycemia Unawareness in Type 1 Diabetes – Thomas Kubiak and Norbert Hermanns Chapter 31: Feasibility of Ambulatory Sleep Diagnosis – Egon Stephan, Dirk Alfer, Ansgar Feist, Leonie Fricke, Markus Mühlensiep, and Rolf Weiss Chapter 32: Electrodermal Long-Term Monitoring in Everyday Life – Wolfram Boucsein, Florian Schaefer, and Thorsten Sommer Chapter 33: Some new Developments in Ambulatory Assessment Devices – Egon Stephan, Gerhard Mutz, and Ansgar Feist Chapter 34: From Ambulatory Assessment to Telemedicine. Conceptual, Technical and Political Aspects of Remote Data Transfer – Christian Leopold Chapter 35: Origins and Developments of Ambulatory Monitoring and Assessment – Jochen Fahrenberg.